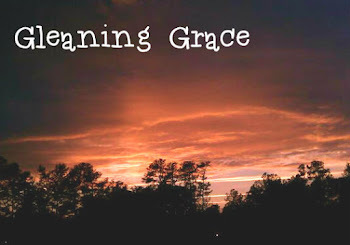 Gleaning Grace: is grace measured by fear? Is my personal level of grace measured by my personal level of fear? Or is fear measured by grace? That means a spirit of fear comes from un-Godly sources, and in my opinion, Satan. I know I shouldn't be fearful. I know I should trust God for the best outcome, even if it isn't what I WANT to be the outcome. But still, I am scared. I am TERRIFIED! I am scared of all the unknowns. I'm hopeful the Doctors are wrong, but I'm scared that they're right. I'm scared they are wrong but in a bad way and that Mom has less time than they say, not more. I'm scared of losing my Mom. I'm scared my kids will not have their Grandmother around for all the milestones they'll want to share with her later in life. I'm scared that if they aren't even teens when she leaves us, that they might forget her a few years after she's gone. I realize that many of these feelings are borderline irrational. And all of them are selfish! I don't want to be selfish and I don't want to be afraid. In fact, I HATE fear, and I hate being fearful. Hate is a strong emotion and a strong word and I don't use it lightly~that's what I tell my kids, too. I want to be hopeful, I want to be prayerful. I want to be filled with God's perfect peace. I want to be full of grace, which ultimately comes from Him. And since that was my original purpose for starting this blog, I'm guessing you guys are going to see a journey towards grace that none of us expected! So maybe this is an opportunity: at least an opportunity for personal growth, and at best, an opportunity for achieving grace. I am grateful that God gave me the parents I have to love and be loved by for as long as we are all here on earth. I am grateful that we all believe and look forward to eternity together with God. I am grateful for a Mom who taught me so many things, not the least of which is how to find the good in every situation (though sometimes we find it in hindsight, far removed from the struggle). I am grateful. I strive to be more grateful everyday. Thank you for reading and please know I value your feedback. Words of wisdom, hope, prayers, all are welcome in my comments section.